Having spent all of yesterday and a little of the day before spreadeagled, inverted and jammed into tiny spaces of a sauna, while bits of fibreglass and sawdust worked their way into sweat filled body crevices, it was difficult to see how connecting a few wires could be anything less than a doddle. That was before one of us picked up the soldering iron, cleaned the tip, removed it, warning the other that it was very hot before immediately picking said tip up with bare fingers to put it away. That does tend to take one’s mind off all the tiny splinters of copper, and cuts and nicks and bangmarks on every other part of one’s body, and it does take one’s mind off all of one’s other aches for a time too. 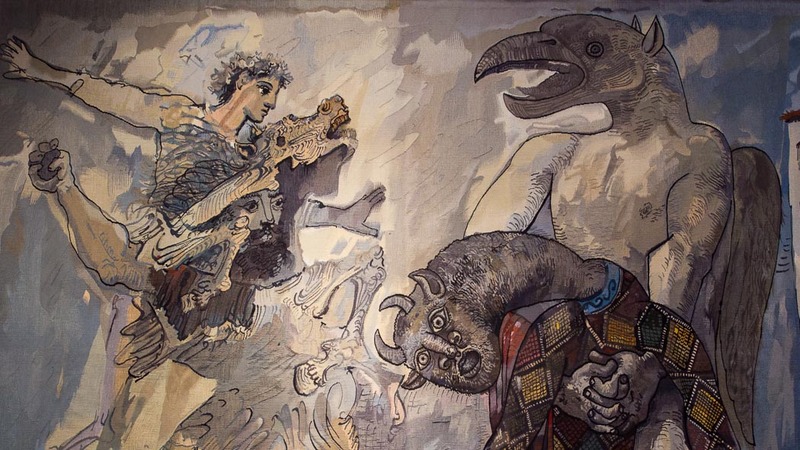 Suddenly one’s thoughts turned to that weaving exhibition in Sarrebourg of two days ago, and one began to understand with new clarity, exactly how Picasso was feeling. Eventually though, the soldering was done, the new connections fitted and the teeniest bit of current flowing from panel to battery. On shore power with batteries fully charged there is no way to do a complete test but we’ll be underway tomorrow and then we’ll find out if it was worth the pain. Midge, now that you have finished with the nearly interminable work on your house back in Oz, you can't even rest over the French summer? Some people are gluttons for punishment. Hi Jack! I've only just received these comments - something is awry in internet land - quite possibly a lack of bandwidth in our new forest environs! Don't fret though, the work is done and if I'm not careful I'll get bedsores from all the lying around!